The artificial cherry tree looks similar to real cherry tree, and the number of cherry blossoms is large and the color is bright. The trunk and flower branches of the artificial cherry blossom can be separated, and it is convenient to install and transport. 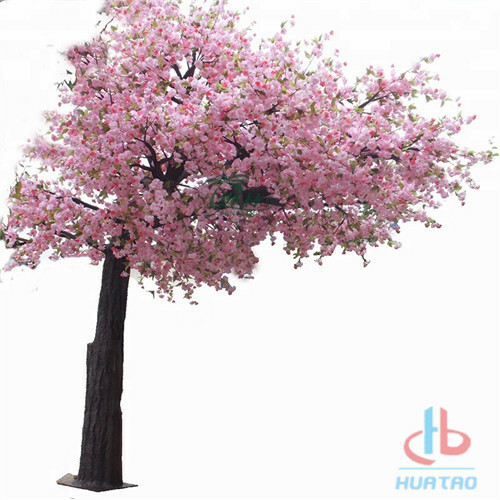 The artificial cherry tree has features of beautiful, don`t fall, environmental kindly and durability. It can be widely used in shopping malls, parks, hotels, office buildings, zoos, tourist attractions, etc. Don't worry about pollen allergy, it can create a romantic atmosphere, which is a good choice for decoration. We hope we could provide people all over the world more convenience by high quality products. Leading by the value of [Stick to the baseline of morality, think about Others and strive for excellence" we are dedicated to provide custom-designed and solution-based products to meet specific requirements. 1.Don't need water, soil and nutrients, easy to maintain, not affected by the natural climate. 2. The shape can be made according to client`s preferences. Hebei Lover Artificial Plant company is a professional supplier of artificial products for more than 10 years. Our product including Synthetic Artificial Grass Turf, Artificial Trees, Artificial Vine,Artificial hedge plant, artificial flowers and artificial plant sculpture. Company Name: HEBEI LOVER ARTIFICIAL PLANTS CO.,LTD.